This article is about the action. For other uses, see Blessing (disambiguation). "Bless" redirects here. For other uses, see Bless (disambiguation). In religion, a blessing (also used to refer to bestowing of such) is the infusion of something with holiness, spiritual redemption, or divine will. 'To be blessed' means to be favored by God, the source of all blessing. Blessings, therefore, are directly associated with, and are believed to come from, God. Thus, to express a blessing is like bestowing a wish on someone that they experience the favor of God, and to acknowledge God as the source of all blessing. A biblical damnation, in its most formal sense, is a negative blessing. I will bless you, I will make your name great. May Adonai turn His countenance to you and grant you peace. In Rabbinic Judaism, a blessing (or berakhah) is recited at a specified moment during a prayer, ceremony or other activity, especially before and after partaking of food. The function of blessings is to acknowledge God as the source of all blessing. A berakhah of rabbinic origin typically starts with the words, "Blessed are You, Lord our God, King of the universe..." Rabbinic Judaism teaches that food ultimately is a gift of the one great Provider, God, and that to partake of food legitimately one should express gratitude to God by reciting the appropriate blessing of rabbinic origin prior, while torah mandates an informal blessing afterwards. Jewish law does not reserve recitation of blessings to only a specific class of Jews; but it does mandate specific blessings to specific occasions, so that, for example since medieval times, Jewish women chiefly recite a rabbinic blessing after lighting two Shabbat candles. Blessings and curses of Christ appear in the New Testament, as recounted in the Beatitudes of Luke 6:20-22. Within Roman Catholicism, Eastern Orthodoxy, Anglicanism, Lutheranism, and similar traditions, formal blessings of the church are performed by bishops, priests, and deacons. Particular formulas may be associated with episcopal blessings and papal blessings. In Roman Catholic, Eastern Orthodox, Anglican, and Lutheran churches blessings are bestowed by bishops and priests in a liturgical context, raising their right hand and making the sign of the cross with it over persons or objects to be blessed. They also give blessings to begin divine services and at the dismissal at the end. In the Eastern Orthodox Church liturgical blessings are performed over people, objects, or are given at specific points during divine services. A priest or bishop usually blesses with his hand, but may use a blessing cross, candles, an icon, the Chalice or Gospel Book to bestow blessings, always making the Sign of the Cross therewith. When blessing with the hand, a priest uses his right hand, holding his fingers so that they form the Greek letters IC XC, the monogram of Jesus Christ. A bishop does the same, except he uses both hands, or may hold the crozier in his left hand, using both to make the Sign of the Cross. A bishop may also bless with special candlesticks known as the dikirion and trikirion. When blessing an object, the rubrics often instruct Orthodox bishops and priests to make use of such substances as incense and holy water. Also, formal ecclesiastical permission to undertake an action is referred to as a "blessing". The blessing may be bestowed by a bishop or priest, or by one's own spiritual father. When an Orthodox layperson bestows a blessing, he or she will hold the thumb and first two fingers of the right hand together (the same configuration used when making the Sign of the Cross on themselves), and make the sign of the cross over the person or object they are blessing. In the Methodist tradition, the minister blesses the congregation during the concluding part of the service of worship, known as the benediction. With regard to house blessings, the Methodist The Book of Worship for Church and Home (1965) contains "An Office for the Blessing of a Dwelling". In the Roman Catholic Church a priest or bishop blesses the faithful with the Blessed Sacrament in the monstrance during Benediction of the Blessed Sacrament. According to the guidelines given by the Vatican's Congregation for the Discipline of the Sacraments that govern the procedures for liturgical ceremonies, if a Roman Catholic layperson (a lay acolyte or parish administrator, for example) or any non-ordained religious (who is not the superior of the congregation) leads a Sunday service (other than a Mass, which requires a priest to celebrate), such as Eucharistic adoration, the Rosary, or celebration of the Liturgy of the Hours, he or she does not perform rites or sacraments reserved to the clergy and does not solemnly bless the people as a bishop, priest, or deacon would at the end of the service; an alternative format is used instead. In the Lutheran Churches, priests are often asked to bless objects frequently used by or sacred to individuals, such as a cross necklace; in addition, Lutheran clergy also bless the homes of members of the congregations. Blessings in Islam has twofold aspect, according to major scholars of Islam Blessings are given by Allah as a trial for mankind. Scholars of Islam believe that having fear of being gradually misled by blessings is an attribute of the pious and not having fear from such even though one is constantly misbehaving is an attribute of the impious. In Islam, blessings can be a source of success in afterlife if one is grateful to Allah for them and the same blessings can be a source for damnation in afterlife if one doesn't constantly be grateful to God for them.Islam has no clerical caste, and therefore no blessings reserved to specific individuals. Muslims will frequently pronounce "peace and blessings be upon him" when mentioning the name of Muhammad or indeed, any of the prophets. Muslims will also greet one another with a blessing every time they meet and depart (السلام عليكم ورحمة الله وبركاته as-salāmu alaikum wa rahmatul-lāhi wa barakātuh (meaning "may peace, mercy and blessings of God be upon you")). Indian religions, which includes Hinduism and its offshoots Buddhism, Jainism, Sikhism, etc. are also called Dharma religions, all of which are based on the concept of dharma and karma and typical blessings are based on Adhiṣṭhāna, Añjali Mudrā, Darśana and Mudra, etc. Blessings in Buddhism, ceremonies are meant to provide a blessing. A blessing can also be a request for permission, as in "gaining your parents' blessing" would consist of having been granted consent. Clergy will normally receive a blessing from their ecclesiastical superiors to begin their ministry. In the Russian Orthodox Church pious laymen would go to a starets (elder) to receive his or her blessing before embarking upon any important work or making a major decision in their life. In the Church of Jesus Christ of Latter-day Saints, a member may receive a special blessing, known as a patriarchal blessing, as guidance. In the U.S., there are sometimes ritual ceremonies to bless companion animals. 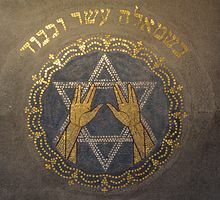 ^ The mosaic text reads "בשמאלה עשר וכבוד" ("in her left hand riches and honor"), which is a part of Proverbs 3:16. ^ The Book of Worship for Church and Home: With Orders of Worship, Services for the Administration of the Sacraments and Other Aids to Worship According to the Usages of the Methodist Church. Methodist Publishing House. 1964. p. 373. Retrieved 25 March 2017. ^ Jackson, Katie (1 March 2017). "What is a house blessing and should you have one?". Fox News. Retrieved 16 September 2018. ^ 00:00. "20. Priesthood Ordinances and Blessings". Lds.org. Retrieved 2016-09-16. ^ a b "Meaning of Blessings in Islam". ^ Assavavirulhakarn, Prapod (1987). "Blessing" (PDF). In Jones, Lindsay (ed.). Encyclopedia of religion. 2 (2nd ed.). Detroit: Thomson Gale. p. 981. ISBN 978-0-02-865997-8. Archived from the original (PDF) on 2017-03-02. ^ Holak, Susan L. (2008-05-01). "Ritual blessings with companion animals". Journal of Business Research. Animal Companions, Consumption Experiences, and the Marketing of Pets: Transcending Boundaries in the Animal-Human Distinction. 61 (5): 534–541. doi:10.1016/j.jbusres.2007.07.026. Look up blessing in Wiktionary, the free dictionary.